Oversized, this Outrigger Endcap C-Channel Sign Holder offers copious space for product Info, price, or promotional messaging. Here unused, naked it offers an opportunity to consider the execution and construction. Look close to see a single hang hole to allow the large C-Channels to run through a powdercoating line. Coverage and brilliant white color were excellent. 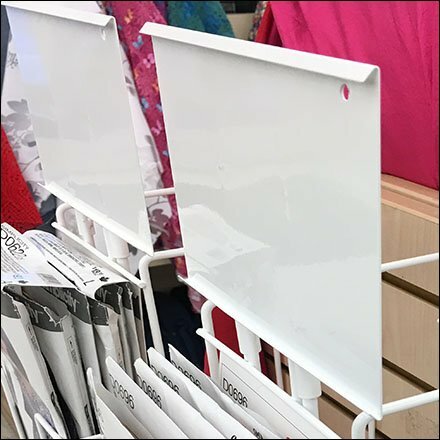 This Outrigger Endcap C-Channel Sign Holder seen at JoAnn Fabrics and Crafts. For Jo-Ann posts by Title see..